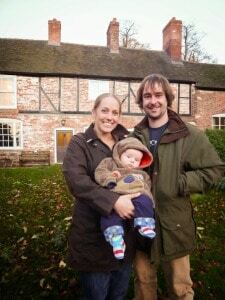 Hi, my name is Ben Hollins and I am the tenant farmer at Fordhall. 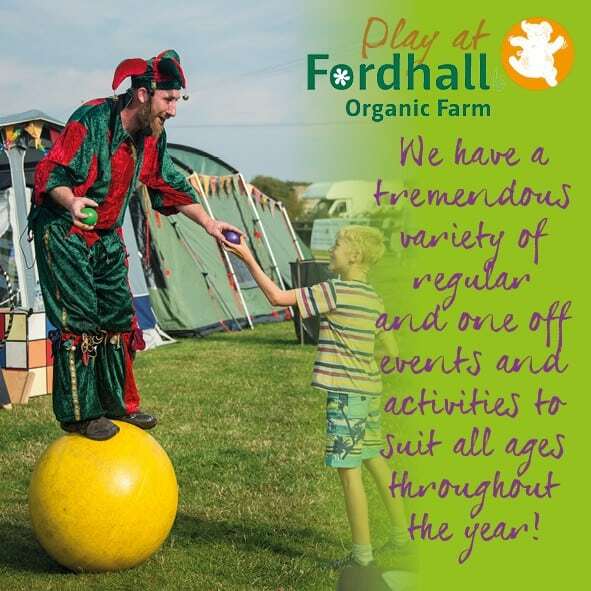 I live on the farm with my family and I run the working farm here at Fordhall. I am carrying on my late father’s philosophies of organic production, whilst learning my own new ways of improving Fordhall. Our pastures, including our cows and sheep, are all fully certified organic with the Soil Association. These principles include high standards of animal welfare; low levels of environmental pollution, prohibition of genetically modified food, enhancement of the landscape and wildlife habitats, and most importantly soil management, which maintains soil health and which does not involve the use of chemical fertilisers and sprays. We love our soil microbes – they are our hidden factory of workers! My livestock are 100% free-range, grass-fed and graze species-rich organic (chemical free) pastures all year round. Our outdoor reared cattle graze on our organic pastures through winter and summer with no additional grains (otherwise known as Foggage Farming). All Herefords and Aberdeen Angus, our traditional herd is hardy and accustomed to living outdoors they have thick coats to cope with winter weather and all are registered organic with the Soil Association. We rear all our own beef from birth to death and we even have our own pedigree Aberdeen Angus Bull, so no need for artificial insemination! Our cattle calve in the spring (April onwards) and are on the farm for you to see when you visit our free farm trails. This means there is plenty of fresh nutritious grass around for our mothers to provide plenty of milk for their hungry calves. We have recently acquired some pedigree Aberdeen Angus and pedigree Hereford cattle, which are the backbone of the new suckler herd. We do not use routine antibiotics or growth hormones. Neither do we feed additional concentrates through the winter. I have continued my father’s legacy to farm as close to the natural lifestyle of the animal as possible. This means the animals mature slower than in conventional systems, but they are happier and produce a flavoursome and tender meat at the end of it. For more information on organic standards see www.soilassociation.org. With no added fertilisers, no routine antibiotics or hormones, and no other animal feeds, our cattle grow and mature stress-free as they would naturally. The elimination of dry feed from the diet is just one example of how Fordhall’s herd is set apart from the conventional. 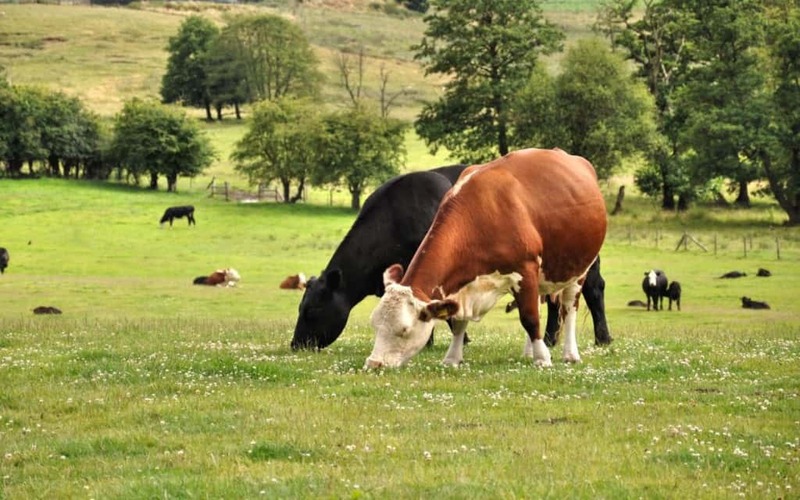 By maintaining a fresh grass fed diet our cattle experience no major dietary changes (as those which may occur when housed dry fed cattle are returned to fresh pastures in the spring). The elimination of dry feed from the diet is just one example of how Fordhall’s herd is set apart from the conventional. By maintaining a fresh wholly grass fed diet our cattle experience no major dietary changes (as those which may occur when housed dry fed cattle are returned to fresh pastures in the spring). Play an essential role in the prevention of coronary heart disease and high blood pressure. Reduce the risk of depression and ADHD (Attention Deficit Hyperactivity Disorder). Help prevent cancer and degenerative illnesses in the walls of arteries Enhance growth promotion and reduce body fat. These fatty acids are called essential, as the body cannot produce them and so they have to be consumed in food. 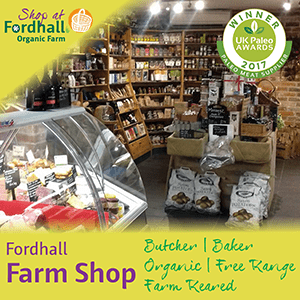 Please note: Although our cattle are registered with the soil association and reared to their organic standards, we are not able to label our beef organic as we currently do not use a registered organic abattoir. We try to minimise the journey our animals take to the abattoir which instead means using the one most local to us. 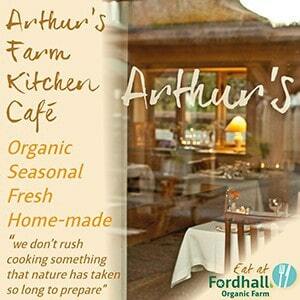 As a result, although our cattle are all organically reared, we cannot label the beef itself as organic. Our flock of sheep, like the cattle, live entirely off our traditional organic (chemical free) pastures. Our natural woodlands provide all the shelter they could need and our spring fed pools have a ready supply of fresh water. Rotation of these lush pastures also helps to protect them from health problems and so veterinary intervention is only used in a rare emergency. All of our sheep are registered organic with the Soil Association. Grazing in synchronisation with the cattle promotes all varieties of grass (both tall and short) to be grazed allowing thick and vigorous growth to continue in our pastures all year round. Our sheep especially relish Sheep’s Fescue, which is rich in saccharine matter. Our flock of sheep lamb at Fordhall each spring (generally late March, early April). An opportunity to see our lambs up close and personal is always available at our annual Spring Fair (generally late April). Please see our events page for more details. 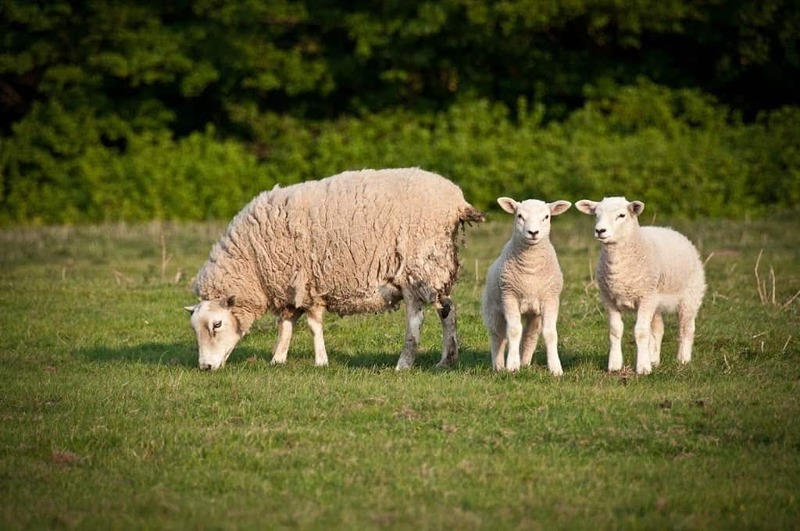 Please note: Although our sheep are registered with the soil association and reared to their organic standards, we are not able to label our lamb organic as we currently do not use a registered organic abattoir. We try to minimise the journey our animals take to the abattoir which instead means using the one most local to us. As a result, although our sheep are all organically reared, we cannot label the lamb itself as organic. 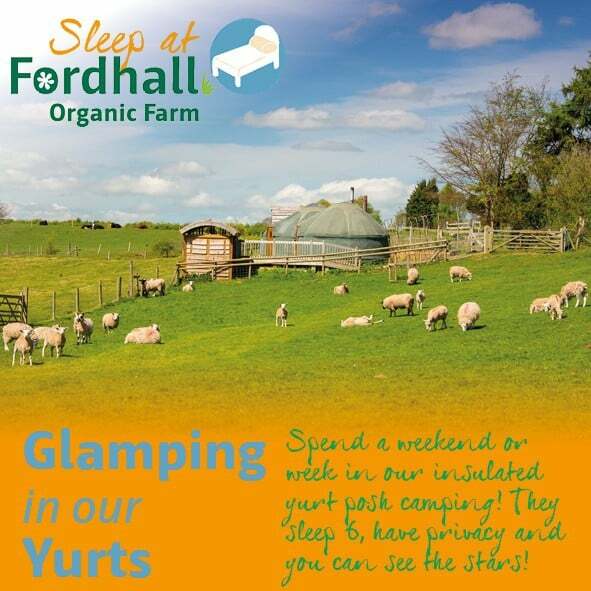 Fordhall’s pigs live free-range where they enjoy rooting and rummaging amongst the undergrowth. Their feed is supplemented with a GM Free, vegetarian cereal mix (not organic) as well as brewer’s grains from our local micro-brewery, Joules, in Market Drayton. Unlike the cattle and sheep, our pigs do use a building for shelter. These do not have doors; instead they allow the pigs to wander in and out to the paddocks as they wish. We use purpose built pig arcs, or our old military buildings that still remain on the farm (and are pretty solid, if not pretty). We rear Gloucester Old Spots crossed pigs. 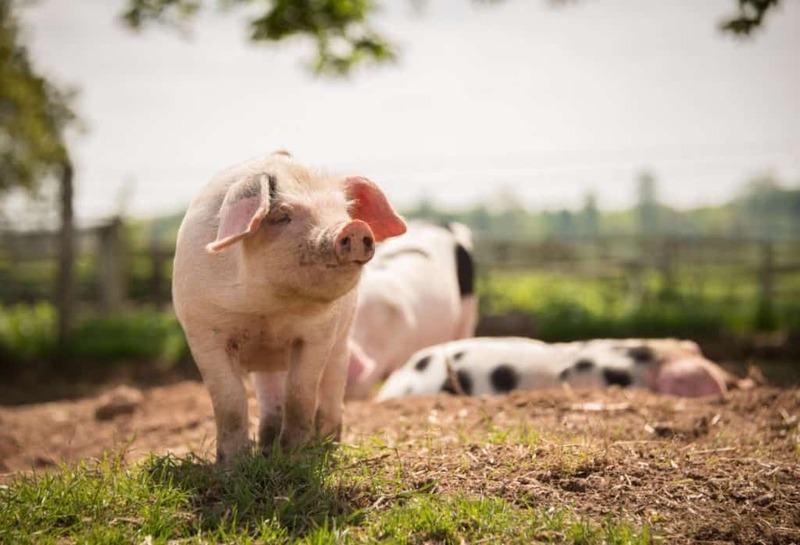 Our traditional Gloucester Old Spot pigs mature slower than the conventional breeds, which allows flavour to build, something that shouldn’t be missed. An exciting project for 2011 was the introduction of an orchard to the pig areas. We planted traditional varieties of fruit trees to provide shelter and food for the pigs, organic matter for the soil and maybe (one day) even some spare fruit for us! This is an evolving project, as we experiment with fencing off the trees from the rooting pigs! Our pigs live next to our picnic area, everyone seems to love watching the pigs – if you’re lucky you may see some piglets too. Interesting fact: Instead of paying for our brewer’s grains from Joules, we barter! This means we swap the grains for pork, which Joules then use to make sausage rolls with to give away on their pub bars on a Friday night!